Sometimes you do not feel like going out for movies. You want to remain at home in your cozy couch and watch movies at home. You suddenly wish for a theatre at home. Well, we are here to make your wish come true in no time. Home theatre is a virtual theater built in house designed to work just like a commercial theatre both in performance and feeling. It is also called a home cinema because of its striking resemblance with the commercial theatre. 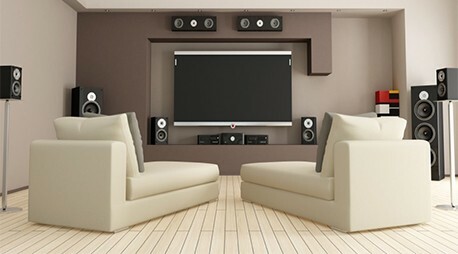 With a home cinema, you can sit back and relax at home and experience a whole new world of cinema. It is the best example of home entertainment. You can enjoy the same video and quality in our house. Depending on the space available, it may simply be a temporary version with foldable screen, a projector and couple of speakers, or a permanent fixture with huge screens and dedicated audio set up poolside. We provide our valued customers with installation facility. Our installation is carried through the hands of well-equipped and trained staff members who try their level best to provide you best services so that you can enjoy a peaceful time at home. We can install the theater anywhere anytime. Whether you like indoor environment or outdoor environment, we will provide it to you. Home theater in a box, HTIB is an modestly-priced integrated home theater package which "bundles" together a combination DVD-Video or Blue-ray Disc player and multi-channel amplifier (which includes a surround sound decoder, a radio tuner, and other features), speaker wires, connection cables, a remote control, a set of five or more surround sound speakers (or more rarely, just left and right speakers) and a low-frequency subwoofer AV receiver, often referred to as home theater systems or home entertainment system Front video projector and projector screen, often referred to as a home theater or Home cinema.